Hertz, facing strong competition in the car hire market, identified a weakness in its customer care at collection and drop off points. Here’s how we communicated with staff. To improve customer care and attention to detail at point of collection. Desk, admin and car valeting & parking staff. They are busy and sometimes do not notice small items needing attention which may irritate customers. By paying more attention I can please customers, improve the rating of my branch and also maybe win some prizes. It looks like fun as well. 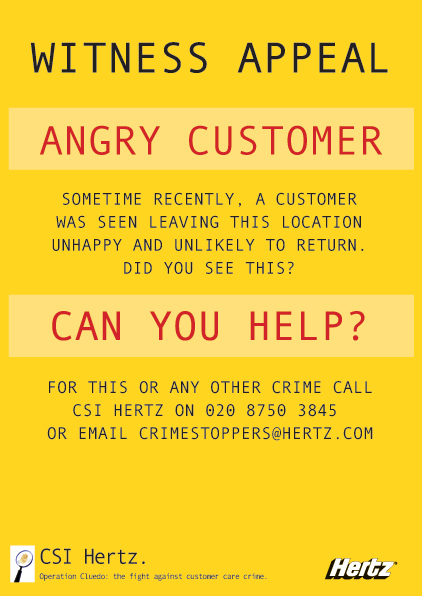 Hertz CSI – can you help your customer? Vibrant posters with clear messaging helped improve customer care. With no budget for new photography we used stock images and well known phrases to product a series of posters, cards and leaflets. Staff could answer simple customer care questions to win prizes.